From the Cumberland Gap to the Atlantic Ocean, this is Virginia Water Radio for the week of November 18, 2013. This week, we feature more mystery sounds. Have a listen for about 20 seconds, and see if you guess what’s draining where. And here’s a hint: If these liquids together flow, ‘twill be a tale of woe. If you guessed water and oil, you’re right! And if you guessed that the oil is going into a recycling drum, you know the right way to dispose of used motor oil. The well-known adage that “oil and water don’t mix” has been applied figuratively to many unlike substances, and even to incompatible people. But it’s literally and particularly true when it comes to keeping petroleum products, including used motor oil, away from surface waters and groundwater. Used motor oil’s slow breakdown and its transport of various toxic substances give it a high pollution potential; according to the U.S. EPA, the oil from one automobile oil change can contaminate a million gallons of water. Automobile oil leaks can also lead to water contamination by dripping onto roadways and then getting washed by stormwater into waterways. So if you’re a car owner, help keep these two incompatible liquids apart—take care of oil leaks, and take used oil to the nearest oil-collection center. You can find your nearest collection center by phoning 800-CLEANUP [800-253-2687] or visiting search.earth911.com. Graphic from the U.S. EPA’s “Used Oil Management Program” Web site (www.epa.gov/epawaste/conserve/materials/usedoil/index.htm) and the agency’s “You Dump It, You Drink It” campaign. 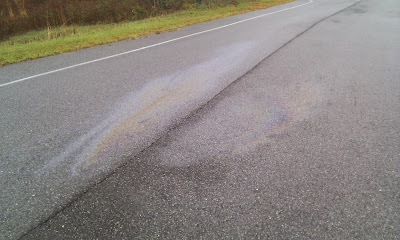 Automobile oil leak on a street in Blacksburg, Va., on November 16, 2013. Acknowledgments: Virginia Water Radio thanks Advance Auto Parts in Blacksburg for permission to record sounds at their used-oil collection station. Information on potential water pollution from used motor oil was taken from the U.S. EPA, “Used Oil Management Program,” online at http://www.epa.gov/epawaste/conserve/materials/usedoil/index.htm. The EPA’s “You Dump It, You Drink It” campaign focuses on the proper management of used motor oil and includes a variety of free, printed materials that are available both in English and in Spanish. Materials are available online at the Web site listed, or you can order materials by phoning (800) 490-9198. An EPA poster about preventing car oil leaks to protect water is available (as PDF) online at http://cfpub.epa.gov/npstbx/files/psatautooil.pdf.